. Published on Thursday, May 31, 2018 . Figuring out where to eat at can be totally frustrating, especially with friends who have diverse tastes and food preferences. As a vegetarian of three years, it’s been a bummer to be that one friend in the group that vetoes every restaurant choice because there isn’t anything for me on the menu. Luckily, I’ve set out a quest to find the best restaurants that have great options for everyone in the group, whether they are a vegan, vegetarian, pescatarian or simply eat whatever is in plain sight. With this roundup, you’ll no longer have to spend 20 minutes bickering about food or scrolling endlessly into the abyss of Yelp. Dr. Grubbs is the perfect place to gather your friends because dishes are simple, personalized and tasty. Plus, the service is amazing! There are also tons of different combos that you can choose from. First, pick your choice of protein, including chicken, tofu, shrimp, salmon or flat iron steak. Then, you choose your sides and your sauce! If you’re vegan, be sure to try the sun-dried tomato pesto sauce. Located just on Temple Avenue and Valley Boulevard here in Pomona, Taco Gourmet Simply Fresh is just a few minutes away from campus. Here, you can find a wide range of great tasting authentic Mexican food! Good news, vegans and vegetarians can order almost everything here too, since there are meat alternatives from Beyond Meat, Beyond Chicken and vegan Daiya cheese. Best of all, there are Taco Tuesday specials under $2! It’s the perfect place for a delicious pick-me-up after your Tuesday classes. The next time you’re in LA, try out The Bun Shop. You might have seen this Koreatown gem on the Food Network’s “Diners, Drive-ins and Dives” or heard about the steamed bao craze all over social media. Originating in Fujian and Tawian, this dish has become the latest craze in the U.S. because of its light, fluffy texture and delicious fillings. At The Bun Shop, you can pick from chicken, beef, spam, tempura vegetables or tofu to fill your buns. 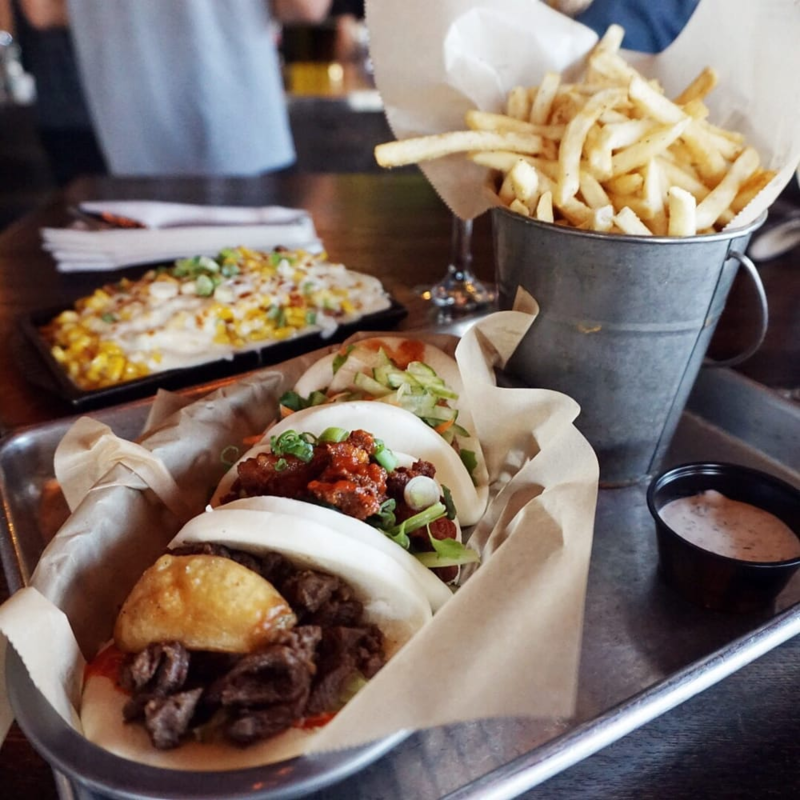 The best part is that it is extremely affordable and there are tons of sides you can order to complement your bao buns, such as corn cheese and stacked fries. Check their site for happy hour times to get the biggest bang for your buck. With a 5-star Yelp rating with over 200 reviews, King Bap has made its mark as a local fave. It is a fast-casual restaurant (think Chipotle-style or Pieology) so you are able to customize your own fresh Korean-style handmade rolls (formally known as kimbap) and rice bowls, made-to-order. The process is simple: choose up to five vegetables, an optional choice of meat and a variety of sauces for your roll or bowl. There are endless combinations for everyone to choose from! Be sure to finish off your meal with their refreshing cold barley tea. If you’re an Instagram enthusiast, you’ll love True Food Kitchen. Not only is the food totally IG-worthy, but the interior design of this Pasadena joint is as well. The menu includes healthy and drool-worthy options for everyone, including raw vegan quinoa bowls to poke nachos. Complement your meal with their unique selection of drinks, such as their honey matcha lemonade and cucumber cooler. Scratch this off your foodie bucket list because you’ll come out with a full stomach and tons of cute brunch photos with your squad! Which of these awesome restaurants will you and your buddies grub at? Be sure to share your photos and experiences with us by using the hashtag #CampusCropChat on Facebook, Twitter or Instagram, and remember to follow us on Snapchat @ASICPP!